…when Simone Balzer and her co-workers’ paper was published in Microbial Cell Factories (Balzer et al., 2013). They describe a quantitative method to not only measure the amount of DNA-translated-into-RNA (using qPCR), but also the amount of DNA-transcribed-and-translated-into-protein (using the fluorescent protein GFP and luciferase). The methods used rely on basic assays, but the power lies in the synergy; by using these methods and then focusing on a couple of abundant promoter-operator complexes used in biotechnology today. Furthermore, the authors used vectors with the same replicon and (almost) the same E. coli strain to make the comparison straight and clear. 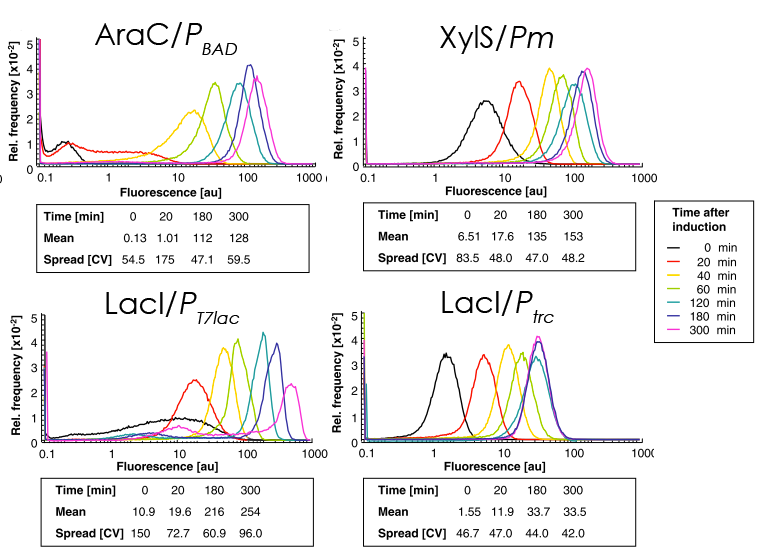 Figure 2: Overview of the main conclusions from the study showing the differences between the XylS/Pm, the LacI/PT7lac, the LacI/Ptrc and the AraC/PBAD system. (Adopted from Balzer et al., 2013). Click on the image for a full-screen version. 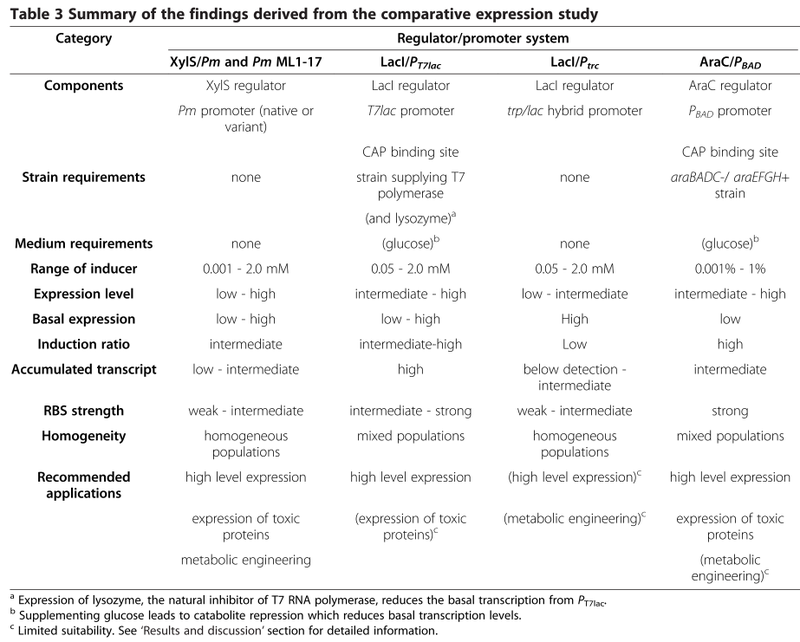 The authors lined up the XylS/Pm, the LacI/PT7lac, the LacI/Ptrc and the AraC/PBAD promoter/operator systems to test the expression levels, basal expression and some other features (see Figure 2). 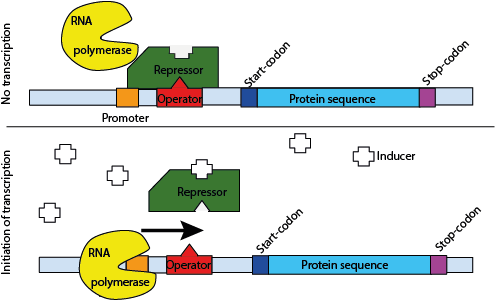 They found a couple of factors influencing the transcriptional properties of the promoter/operator complex, for example the strength of the promoter to recruit the RNA polymerase. Furthermore, the tightness of the binding between the repressor protein and the operator sequence is important and of course the correspondingly ability of the inducer to bind the repressor and induce detachment from the operator. Obviously, strong recruitment of the RNA polymerase can lead to high numbers of transcribed mRNA, whereas weak binding between the repressor and the operator can result in high levels of basal expression. A quite cool result was obtained using flow cytrometry. In general, it is assumed that all the cells have more or less the same level of expression, but by using flow cytometry the real distribution of protein producing cells became clear (Figure 3). So, which promoter and operator system should be used? It all depends on the purpose of the system and also varies from-protein-to-protein. However some general trends can be revealed. The LacI/PT7lac generates significantly more transcripts than the other systems. If the number of transcripts is a bottle neck, you should go for LacI/PT7lac. The LacI/Ptrc system has a fast onset time and the expression profile is homologous on inter cell level; furthermore, the system is strain independent. AraC/PBAD should be used when tight regulation in the uninduced state (ie. 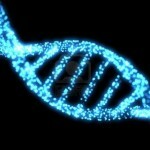 for producing toxic proteins) is desired; additionally, it produces high levels of protein in the induced state. The XylS/Pm system is strain independent and a solid alternative (or orthogonal expression method) for the widely used LacI/PT7lac. As already stated, it still depends from case to case which system generates the most active amount of protein. The authors suggest carrying out an initial screen early with the different systems to determine the most favorable setup for your protein. The article is freely available at the webpage of Microbial Cell Factories! 2 Responses to On promoters and operators, which combination is the best? Three different regulator/promoter systems were chosen to substitute the region spanning xylS/Pm in pSB-M1b and pSB-M2b.